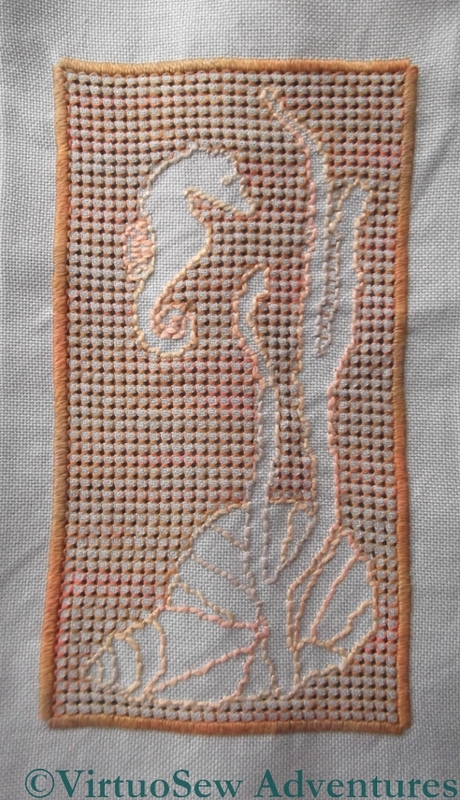 Finished the silkwork on the Petite Pincushion! Very pretty and I love the variation of texture and colour. I can’t at the moment think of what you might do with it either. Never mind, knowing it’s beautiful will do; you don’t have to believe it’s usefull as well. I know! Frame it and hang it in the bathroom! I’m glad to know that I’m not the only one who has half-finished projects…I feel for you…the angst, the guilt, the dilemma…it’s a very lovely piece, I’m sure that inspiration will strike! I like it a lot, but it is a bit chunky. I’d make it into a quilt…. I know it is not quite the same but when I saw this I thought of this here http://www.jmddesigns.co.nz/seahorse.htm maybe you could finish your piece doing something along similar lines and frame it. It would be a shame to leave it unfinished. I look forward to seeing what you do with it. I wonder if it’s the ratio of the background to the motifs that you’re not happy with. There does seem to be a big blocky area on the left and perhaps that’s unbalancing the design? Just a thought. How about doing your “Assisi work” in a way that would represent moving water? Knowing your bathroom, I think it would fit there! I think your outline around the outside is too heavy and too angular. Perhaps if you removed this, changed the shape that you work with pulled thread and replaced the outline stitching with some thing finer it would balance better. Just a suggestion. I like it as it is. Having no reference to size, I can’t comment on that, except that it seems OK from what I see. Perhaps if you really don’t like it, you can use it as a beginning for a very encrusted piece. 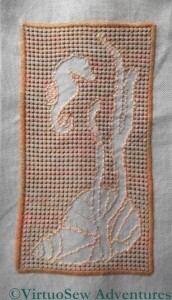 Just stitch over it as if it were plain fabric, or fill in certain areas (but not the negative spaces you’ve created). Perhaps the pattern would stand out if the background were a darker shade? How about painting the unstitched areas? I do agree that as it is it doesn’t ‘work’, but the idea was worth following through. And without the ‘what if’s’ where would we all be?! I agree with Alex re the weight (or ‘non-weight’) in the lower right hand corner. Also, I can see the motifs done in bright colours – but that is probably because I’m not seeing the variegation in the colours of the background as well as they appear IRL.